It was that time of the year again when Bangalore geared up to be a proud host of what is known as Asia’s premier air show! The Yelahanka air force station was decked up for Aero India 2009 from 11th February to 15th February. Defence Minister Mr. A K Antony declared Aero India 2009 open and also announced that the next Aero India will be held on 9th to 13th February, 2011. The inaugural site was house full with over 50 delegations including air chiefs, air marshals and generals from the airforces of US, UK, Germany, Sweden, Myanmar and other countries. Chief Minister, Dr. Yeddyurappa also addressed the delegates. This international event was managed by the Confederation of Indian Industry (CII), and supported by the Government of Karnataka. Visitors at the inauguration witnessed breathtaking flying displays including a unique show of Advanced Light Helicopter (ALH) leading the formation of two Kiran jet trainers and two Sukhoi 30 Make 1 (Su-MKI). Aero India includes both flying and static display of wide range of military and civil aircrafts from aerospace giants and exhibition from wide range of related industries across the world. The visitors got an opportunity to witness flying displays of leading combat aircrafts in the world like Lockheed Martin’s F-16, Boeing’s F/A 18, EADS’s Eurofighter and Mig-Russia’s MIG-35. This show has brought together about 600 exhibitors. There was heightened security this year and tickets and passes had RFID tags to ensure each person going in and out of the air base in Yelahanka can be tracked! Apart from many international exhibitors, Indian defence companies like HAL( Hindustan Aeronautics Limited), BEL (Bharat Electronics Limited) and research organizations like DRDO ( Defence Research and Development Organization) participated. For those of you who thought Aero India was just about air shows, well it means big business to the aerospace industry of India and the world. It serves a platform for interaction between industry and potential customers. It provides opportunity for joint ventures and business partnerships. Interestingly, before all the ‘big and the famous’ came up, the moment of pride for India came with the flight of the indigenous Light Combat Aircraft (LCA), Tejas. Developed by DRDO and manufactured by HAL, it made a majestic debut and took off to the sky like a pro. LCA can perform gravity defying manoeuvres that combat aircrafts are famous for. It is the lightest combat aircraft in the world. From the time of inception of Aero India in 1996 till date, the star for many and my personal favourite Sukhoi 30-mki has always managed to impress the audience! Sharp turns, swift manoeuvres, and vertical climbs have always had people asking for more. I know I never get enough of it! Back in 1996, IAF was eyeing the Su-30 and today it is an integral part of the IAF. Known as the most potent aircraft in the IAF today, the Russian jet is now being manufactured in India. This veteran flawlessly mesmerised the audience this time, too. This year’s Aero India had an added surprise of the award winning ALH Sarang team performing some well coordinated formations. Their show gathered the maximum amount of applause from the audience. ALH Sarang team had won accolades in Berlin air show, too. The immensely popular and children’s favourite Surya Kirans were a tad bit disappointing this time. With an unfortunate death of a team member in a crash on 22nd Jan during training prior to the show, the team cut its display to six aircrafts instead of the usual nine, and to just 7 minutes from the usual 20–25 min. Indeed the first timers here would have missed out on their famous Valentine Day heart formations. It is interesting to know that Surya Kirans also started their flight displays in 1996 (along with Aero India show). Surya Kirans demonstrate the skills of fighter pilots and inspire many to join the air force. The air show also saw some laudable flying display of the visiting international fighters: the Eurofighter Typhoon, the American F/A 18 Super Hornet, the Russian MIG-35 and last but not the least F-16C, also American. These are the medium multirole combat aircrafts. IAF is planning to add fighters to its fleet, and these four are in consideration. On Saturday 14th February, the crowd of visitors was huge, virtually every inch of the exhibition area was occupied. The expressway to the new airport was a blessing for the visitors. 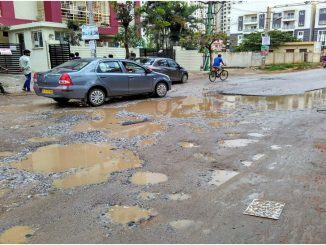 It has definitely saved Bangalore’s face to some extent compared to last time around when the delegates couldn’t stop cribbing about the long jams to the air base and the unruly traffic. From very little media coverage to many news channels covering live shows at the air base, from a quiet defense conference to Asia’s leading air show, from a small audience to a massive gathering (including many celebrities waiting to fly jets). Aero India has definitely come a long way. Come 2011 and I can’t wait for Sukhoi to take off again and have many like me watch the jets in awe! Interesting facts, good article Deepthi. Had been to the show. my feeling then was – How I wish I could fly the F-16! After standing for an hour in hot sun it changed to – How I wish I could get a chair. Great show but inadequate organising.